On 1st March 2017, Land Rover revealed the 4th member of its Range Rover family at London’s design museum-The Velar. At a starting price of $49,000, between Evoque and Range Rover Sports, it is all set to compete with the likes of Porsche Macan and BMW’s X6. The official debut of this mid-sized SUV is set at the Geneva Motor Show next week. The company claims it to be a driver’s car providing much better handling and maneuverability. As it is 8 inches lower than any other SUV in the Range Rover line-up, the chances of rolling while taking a high-speed corner is much reduced. Apart from that, Velar shows a minimalist design approach with addition of much slimmer horizontal taillights which are stretched across the width, a door handle which goes hidden into curvilinear side panels when not in use. All these minimal changes increasing car’s aerodynamics as well. The new addition in the interior design language is a 3 touch-screen plates setup. When vehicle starts, the central display tilts forward and lights up demanding further response from the driver. The Velar comes in various different powertrain configurations. The starting unit, which is the most basic one, includes a 4-cylinder diesel engine thrusting 178bhp and 430Nm of torque which is enough to reach a speed of 0-60mph in 8.4 seconds. The same Ingenium motor is also offered with 237bhp and 500Nm, and CO2 emissions of 154g/km. Most premium configuration comes with a V6 diesel with 296bhp and 700Nm; 0-60mph dash in just 6.1 seconds. Every Velar will come with 8-speed automatic transmission with power in every wheel i.e. four-wheel drive. Land Rover is currently taking orders for Velar and delivery will start from July this year. The decided manufacturing location is Jaguar Land Rover’s plant in Solihull. 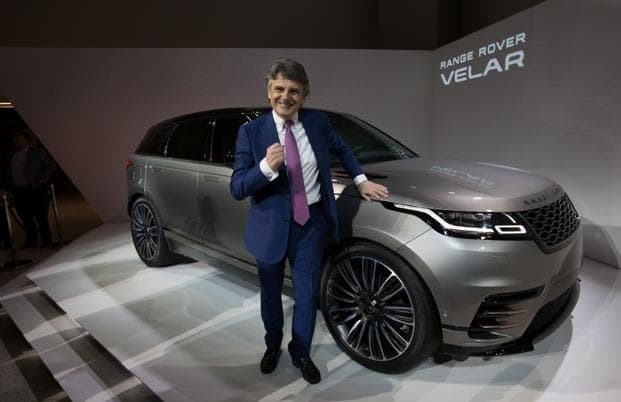 Land rover is planning to own this year with Velar along with a seven-passenger Discovery (redesigned Discovery 5) which will be launched by the end of this year.